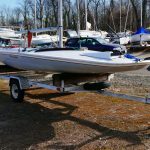 As of spring 2019 , there are seven Inland 20 scows at the Washington Sailing Marina and another couple in the region. Ours is a fleet that combines vintage boats with more modern hulls. The Inland 20 is a great boat for dinghy racing. With as many as 28 control lines and bilgeboards that are switched on every tack, this boat can be exhilarating and humbling. Sailors are rewarded with speeds in excess of 15 knots as befitting one of the lowest Portsmouth ratings of any two-person sloop (except the foiled skiffs.) Best of all, used scows can be found for as little as $500, with sails and trailer. 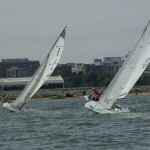 We race with each other Sundays during the regular Potomac River Sailboat Association series in the spring and fall. PRSA is a great organization and they have been terrifically welcoming as the fleet has taken hold. If you are interested in hitching a ride in a scow, or maybe even buying one, leave a message below. Stas Burgiel and his children Rilke and Haiku are the latest to join the Potomac I20 fleet. Stas purchased a 1983 Johnson M20 from Lake Minnetonka, Minn. The boat was converted to an I20 in January 2018 by the team at Scowsailing.com. 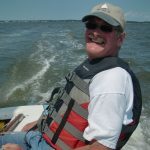 Stas found himself on boats throughout his early childhood — bareboating in the Caribbean, tall ships on the Delaware and tooling around the local reservoir on a Sunfish with his parents. After a few years away from sailing, Stas’ kids provided newfound inspiration with their first sailing experiences. The I20 immediately captured his attention, compared to other boats available at the marina. “Why go slow when you can go fast?” Stas says. The 2001 Windward, as yet unnamed, has national champion credentials, under previous owner Emily Green of Wisconsin. Current skipper Tim Dickson races with a variety of crew. As good as Tim is, watch out for his son Mac Dickson, a red-hot Charleston College racer. Will Fenn stepped up to a 1985 Johnson converted in the winter of 2017. “Firewater” is one of the lightest of the hulls at the marina (579 lbs. ). 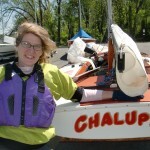 Will began racing the boat seriously in spring 2018. Will grew up sailing M20 scows in the Adirondacks. He is a fierce competitor and has raced in the Midwest, including the 2017 Nationals at Lake Wawasee. Will joined the I20 management team in charge of promotions and marketing. 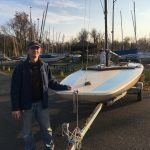 Mark Burrows joins the I20 fleet as a long-time sailor of racer-cruisers with Herrington Harbor Sailing Association in Deale, MD. 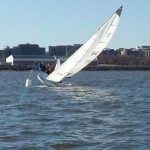 He takes over YouBetchaBuddy , a 616 pound 1984 Johnson with a light and flexible Allen spar fitted with a fixed forestay. As Mark prepped to become an empty nester, he downsized his boat but up-sized his competitiveness. “I raced one-design with the 36.7 fleet and had a great time being part of a fleet. But the fleet broke up and I raced PHRF for the last 9 years…The combination of high speed sailing and one-design competition hooked me into this fleet,” says Mark. The 2012 Crear Boat Works I20 known as Alrighty Then! is raced by Stew Harris and his top gun, Karen Currie. The boat is a marvel of engineering, built entirely of epoxy. It carries self tacking jib, cockpit spinnaker bags and a carbon spar from Ted Van Dusen. But so far, the boat has not found its speed. We shall see if the Harris/Currie team can find Alrighty Then’s magic sauce. “Uff-Da!” was made by Johnson Boat Works in White Bear, Minnesota way back in 1983. This is a stiff boat with Corecell laminate and lots of tweaks to running rigging. 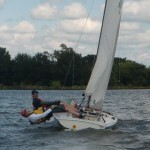 It carries a Melges spar and was converted to an Inland 20 by Windward Boatworks in Wisconsin back in 2009. The Boat is raced by a syndicate of sailors that includes Rob Gosselink and Trip Hook. “Chalupa” is a 16-foot M Scow made by Johnson Boat Works in 1974. 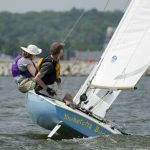 The M Scow is considered “The People’s Scow” because it was so much less expensive when built, and still enjoys popularity in the Midwest and southern New Jersey, where they are regularly raced as a “club boat.” This particular boat has been upgraded repeatedly and is now in prime racing form. It is a lot of fun in a blow; it can feel as though the boat is skipping across the chop. In fact, that is what the 450 lbs. racing scow does. Without at spinnaker, the M Scow is easily handled by an adult and child. 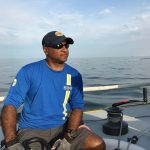 Skipper Ed Ryan is planning to campaign the boat in 2019. 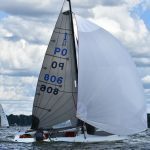 “Barnstormer” is a 1974 Melges M20 converted in 2014 by Scowsailing.com to carry the asymmetrical spinnaker that distinguishes the Inland 20. This boat is a timepiece and sat unused in a Wisconsin barn for at least 20 years. Barnstormer still has its original Proctor spar, a beautiful, supple mast that the afficionados consider best in class. The boat, trailer and sails were acquired from Wisconsin for $500. Question for Stew Harris: Where did you come up with the name “Uff Da!” ? I bought an old wooden M-16 Scow in Lafayette, IN some 30 years ago that had an old wooden stern plate with the same name. I still have the boat. I am restoring it one more time. And I thought I was being original! I’m a Minnesotan and the names of my last three scows pay homage to the state argot. Uffdah!, YoubetchaBuddy! and AlrightyThen! Extend the vowels in the first syllable, add a skeptical note at the end, and you pretty much nail the dialect. Try it yourself…one more time. Alrighty Then!